Even without the Tolkein backdrop Towers is a decent role-playing game. It includes cut scenes to switch from one party of the Fellowship to another. While the cut scenes are appropriate I wish there had been some warning so that I could have continued exploring or had the ability to switch parties manually. I was initially disappointed with the scope of Towers. It took me approximately 12 hours to complete the game; having read the book cut this time considerably. I later found that I had missed most of the adventure. There are many side quests which are not required in order to finish. These quests make up a considerable portion of the game. According to Interplay, the average playing time should be around 36 hours if all the quests are completed. Some Tolkein devotees may not like some of the additional quests and changes made to the story. The game follows the book fairly closely, but often the characters can reach their goals in a different manner than in the book. Of course, this is role playing not a book. There should be some latitude in reaching the goals. Overall, I found Towers to be very enjoyable as an RPG and a good adaptation of Tolkein's work. Even today I would recommend it to Tolkein fans or those adventurers who are willing to go back and explore even after finishing the game. Towers is an RPG adaptation of the second book in the 'The Lord of the Rings" trilogy. It begins in the time following the breaking of the Fellowship. At the beginning, the Fellowship is made up of three separate parties. Frodo and Sam make up one party, Aragorn, Gimli, and Legolas make up another party. Merry and Pippin make up the third party. Each party has a different goal, though each is trying to thwart Sauron's plans. Like the book, when parties reach certain points, the game switches to another party. 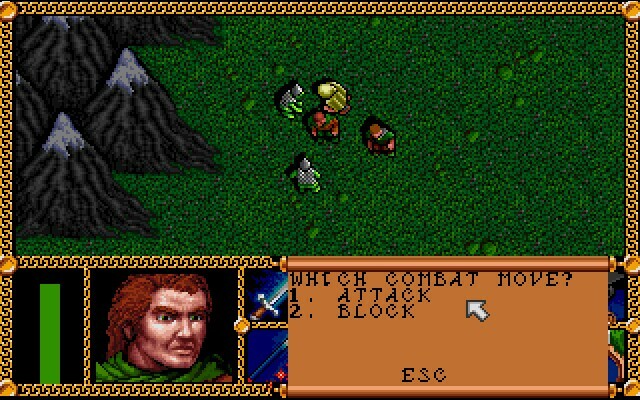 Towers includes all the basic elements of a good RPG such as combat, quests, puzzles, and character interaction. It is a skill based RPG system. Each character has certains skills which make the character unique as opposed to a class based system. For example: some character skills include sword, picking locks, bow, Elven Lore, Herb Lore, and perception. A characters skills determine the actions they can perform and the weapons they can use. There are several places within the game where characters can learn new skills. Towers makes pretty good use of the skills available. For instance, characters cannot find secret passages without perception and the party cannot climb unless a character has that ability. In addition to skills, characters have unique characteristics, including Dexterity, Endurance, Life Points, Strength, Luck, and Willpower. Most of the characteristics are common to RPGs. For example, Life Points are the same as Hit Points in other RPGs. Luck is less common. Characters which are lucky are less likely to be hit in combat. Willpower represents the resolution of the character. Characters with high willpower are less likely to be affected by evil objects, such as the One Ring. The game follows the Tolkein tradition more closely with regards to magic than the pen-and-paper RPG. In Towers, the only party member with the ability to use magic is Gandalf, the wizard. Also, the spells Gandalf may use are very limited. When Gandalf does cast a spell, it has an adverse effect on his health. This runs true to the series because Gandalf rarely uses magic in the series. When he did use magic, he it seemed to affect him physically. Other party members may use words of power but they do not have the ability to cast spells. Each party member starts with a number of these words. These words invoke great powers. Each word of power may used only once. It is up to the gamer to determine when a word should be used because they will only be helpful in certain circumstances. Magic items are as rare as the ability to use magic in Middle Earth. Some party members start the game with magic items. 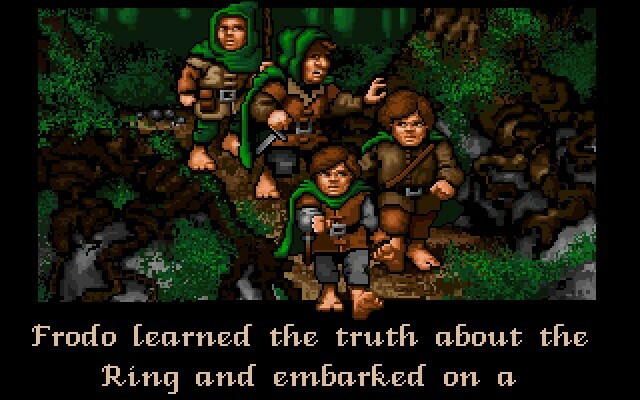 For example, Frodo starts the game with the One Ring and a magical dagger named Sting. Most magic weapons in Middle Earth have names associated with them. Party members will not find many magic items in this game. For that reason, members of the Fellowship should be careful with their magic items because they are not likely to find replacements. When characters become injured there are two methods of healing them. One method is to feed the injured party member. A party member may use food once per day to regain health. Different types of food provide varying curative benefits. Nights in Towers are marked by the darkening of the landscape. Another method of healing is the use of herbs. The herbs used to heal in Towers are Athelas. Athelas may only be used by a character who has the skill of Herb Lore. Combat in Towers is handled on a turn basis. Each party member and enemy gets the chance to attack in turn. Characters with higher dexterity scores will attack first and more often. Most who have read the book will wonder how the larger battles from the book are handled. During the battle of Helm's Deep, the gamer is presented with the information that a group is attacking and asked if he/she wishes the party to engage the enemy. If the answer is yes, then the party is transported to the location of the enemy and the battle begins. This occurs several times to indicate the scope of the battle. Other than the battles, encounters occur without warning and conversation or battle ensues. Don't get the impression that this is a hack 'n slash though. Combat is not rare, but other than the battle of Helm's Deep the combat does not generally last very long. Also, there are enough puzzles and exploration to offset the combat encounters. This is a welcome change from some of the more combat intensive RPGs. Many computer RPGs I have experienced are more akin to wargames than RPGs. The puzzles in Towers are not terribly difficult and usually logical. I really think they did a good job of mixing combat, puzzles, and exploration. If an encounter does not result in combat, there is often the chance for conversation. Conversation is handled by questioning the non-player character (NPC). Questions are made up of a single word which is somewhat limiting. There is a catch-all word which can be used to get information about what the NPC knows. From there, the gamer can generally use words which the NPC used in questioning. As you can see, the character interaction is limited, but it is as good as most current RPGs. In addition to information, some NPCs will join the party. Usually a NPC will join the party in order to complete a certain quest and leave after the quest is completed. The setting of Towers includes fairly large portion of Middle Earth and makes the game quite immersive. The Two Towers is an excellent title, both as an RPG and tribute to John Ronald.